I am a lucky girl. I am married to my best friend. He is more than just my husband, he is a good man. He loves me, works hard, can build just about anything, and is tolerant of my quirky, off kilter style of vintage junk. While he is tolerant, my style is not his particular style. I love mid-century modern, I am not afraid of color and experimentation, I think 1970’s funk is cool, I want junk barn doors on the wall, I don’t want to paint over worn, chippy paint and I LOVE painted furniture. Bright colors are fun. Mr. Math, my hubby, likes neutral colors. He likes natural wood. His style is conventional, traditional, classic and full of history. He is the sentimental one of us. He is the one to keep things that make him remember moments in his life and ours. I totally gave Mr. Math our den to do as he chose. No input from me. No color suggestions, and no throw pillows with one exception. 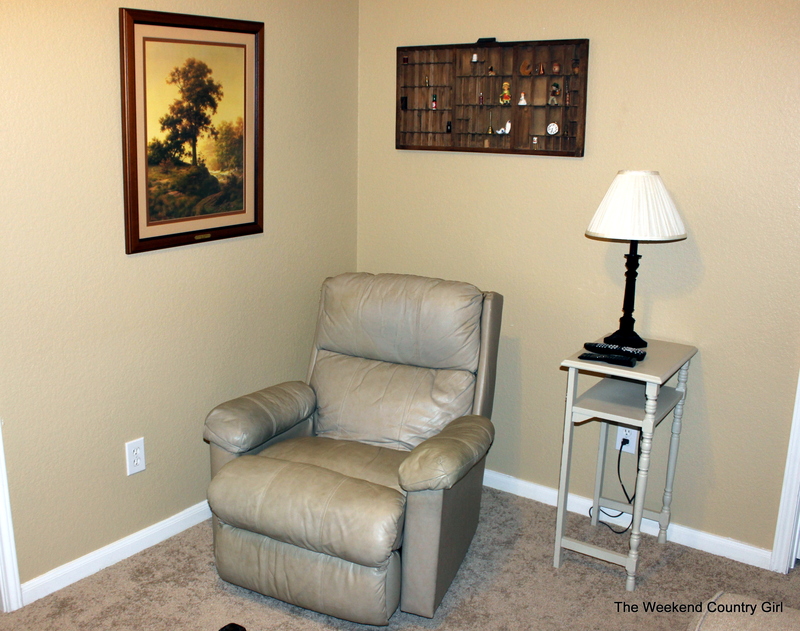 I did veto the barley twist table he wanted to put by his chair. It would not have survived the drinks left to sweat on the waxed wood. I substituted a neutral painted side table. It is the perfect room for him. No windows ( he hates light when watching football), cozy, and quiet. Everything in the room was selected by him. Here is his space. It makes him happy. What can I say? I am glad he still loves me, color and all. 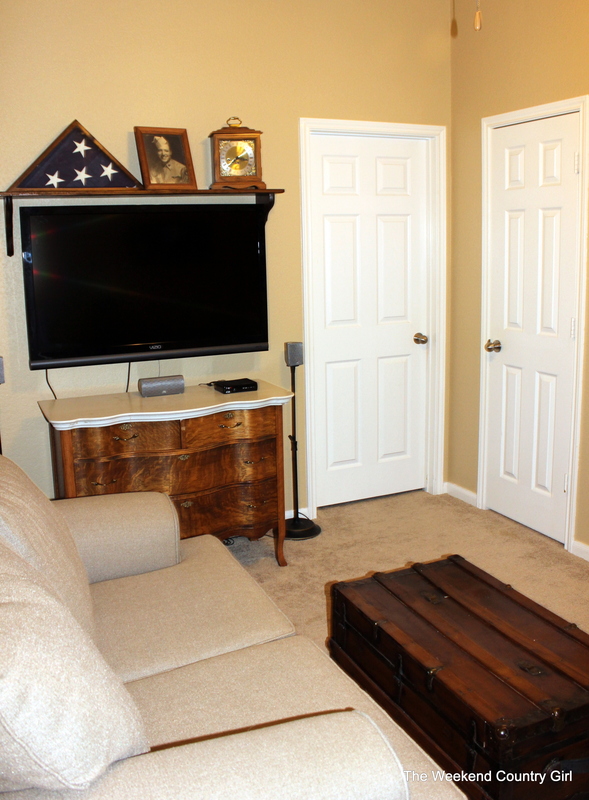 The den from the door. The four doors lead to the two bedrooms, a bathroom, and a closet. 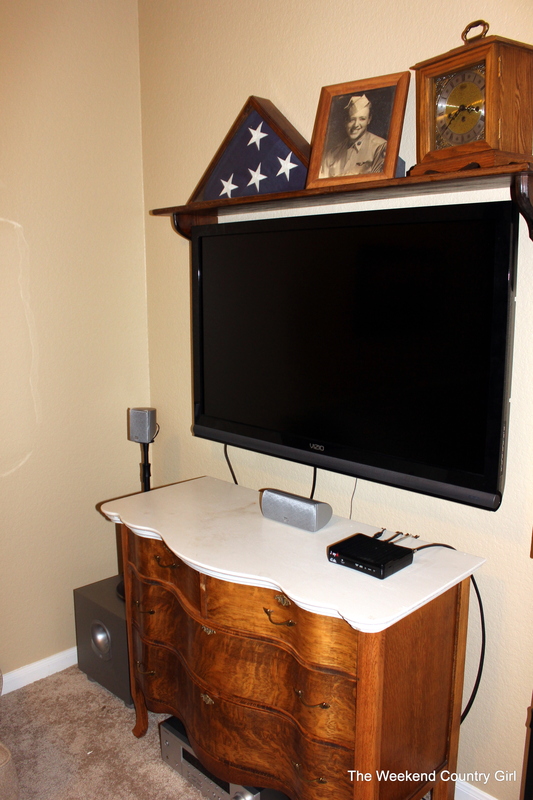 It was my suggestion that he mount the television. He is borrowing this serpentine dresser from our daughter in law for the next year. He has surround sound. In a ten foot by twelve foot room. Sorry about the Lumi photo bomb. 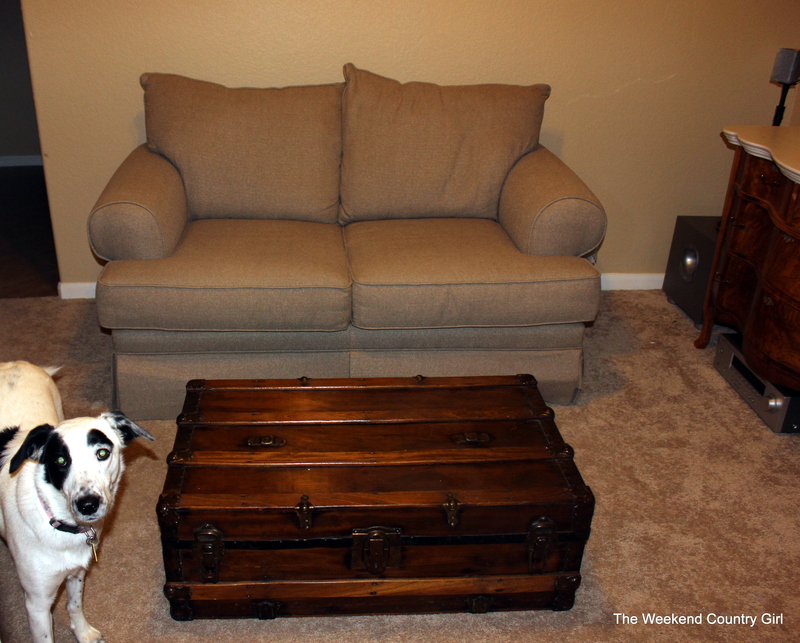 The chest was purchased 20 years ago and holds our wedding photos, baby pictures, and momentos. Note the lack of “decoration” on top. The love seat is throw pillow free. 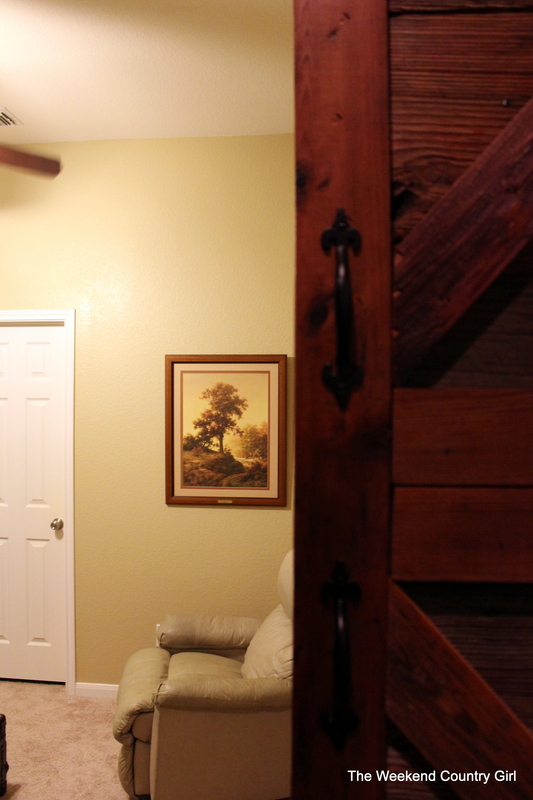 I wanted you to see the amazing barn door from inside the room. Looking into the den from the hallway. Love that door. 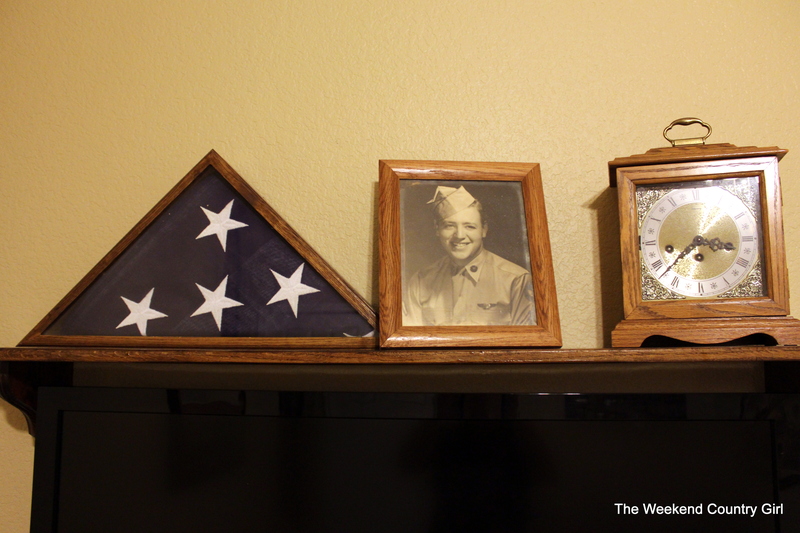 The shelf has Mr. Math’s dad’s flag, photo and a clock my parents gave us when we were newly weds. More than 30 years ago. 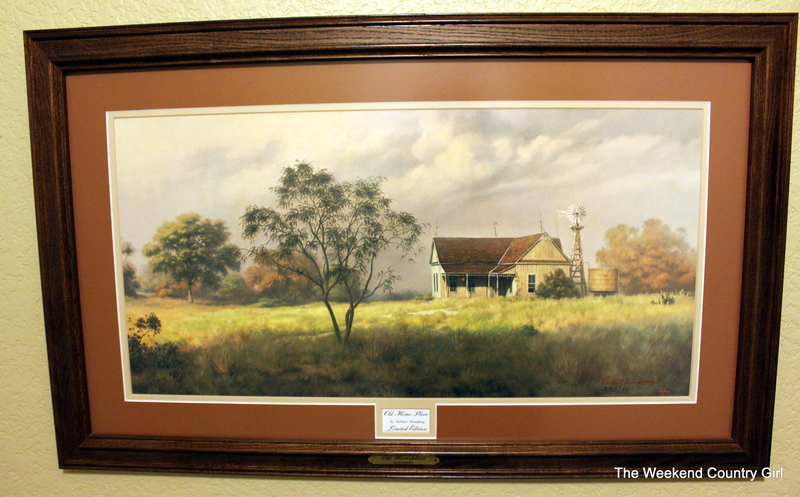 The art work is traditional art from a Texas artist, Dalhart Windberg. This print looks like where Mr. Math grew up. I can see why your 30 years strong. Not only are you friends, you’ve learned to compromise. 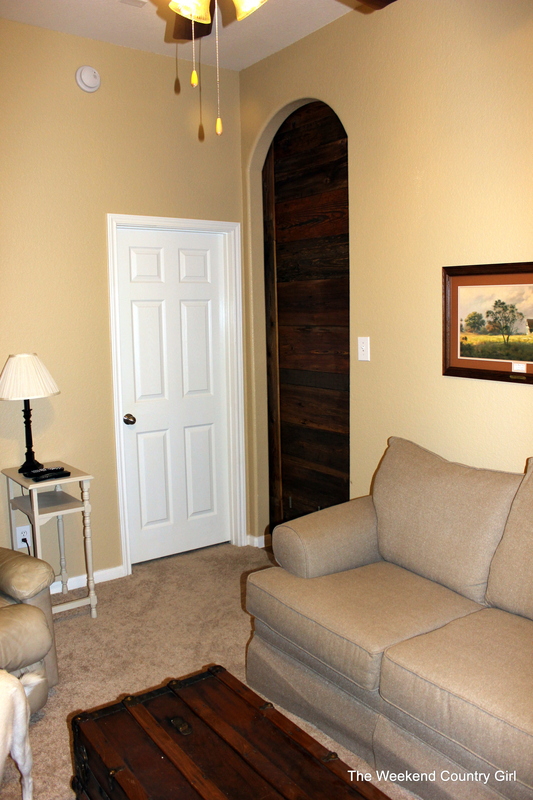 I’m loving the barn door, too!